We describe the operating parameters of high-production-capacity container-glass melting furnaces and specify the service conditions of the melting-tank lining at a specific glass-melt production rate of 2.5 – 3.0 t/(m2·d) and a specific glass production per furnace run of 7000 – 8000 metric tons/m2. We recommend that melt-molded baddeleyite-corundum and vibration-cast sintered chromium-aluminum-zirconium refractories be used in tank structures. Translated from Novye Ogneupory, No. 9, September, pp. 3 – 9 (2018). 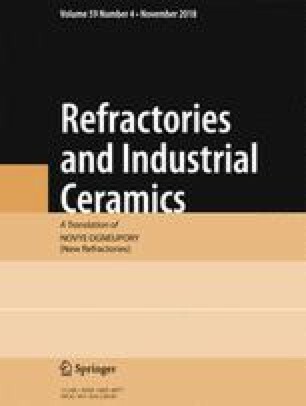 Refractory Materials for the Glass Industry, Prospectus from RHI GLAS GmbH, available from http://www.rhi-ag.com.